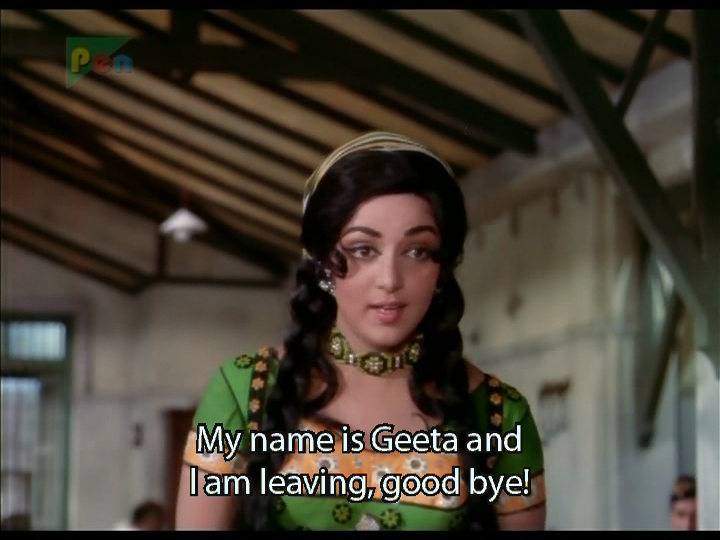 Seeta Aur Geeta is a classic dual role movie so common in Bollywood, but for a change it’s the heroine who has the double part to play and Hema Malini excels as both characters in this tale of separated sisters. This is my favourite film with her as she flawlessly provides drama, action and comedy and looks totally stunning throughout. 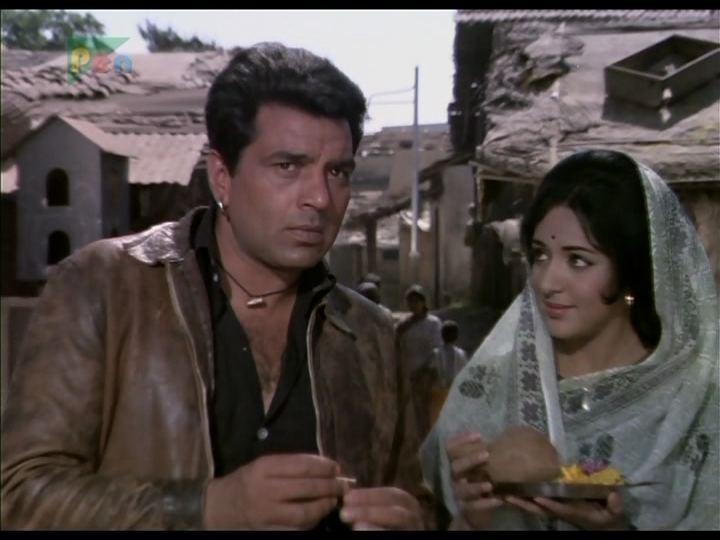 It’s a pleasant change to have a heroine-centric film and although Dharmendra keeps trying to sneak a piece of the action, Hema always gets the last word. You go girl! The film opens by explaining how the twin sisters get separated at birth and brought up by different families. But there are no mystical songs, lockets or other identifying objects needed because the two just happen to be identical, which means of course that there will be confusion between the two when they grow up. First of all we meet Seeta and her family. Her parents are dead and Seeta is living with her Aunt Kaushalya, Uncle Badrinath and their two children. 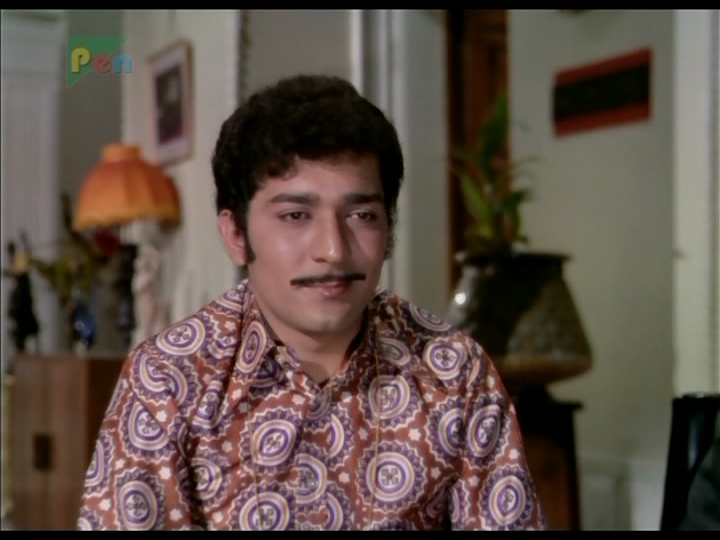 Also living in the house is Kaushalya’s brother Ranjeet (Roopesh Kumar) and Seeta’s grandmother. Kaushalya and her daughter Sheila treat Seeta as a slave and she is constantly abused and overworked. Seeta is the weak-as-water type of heroine I usually want to slap and tell to pull herself together, but since her rather pathetic and hopeless character is the whole point of this part of the film, I can live with it. 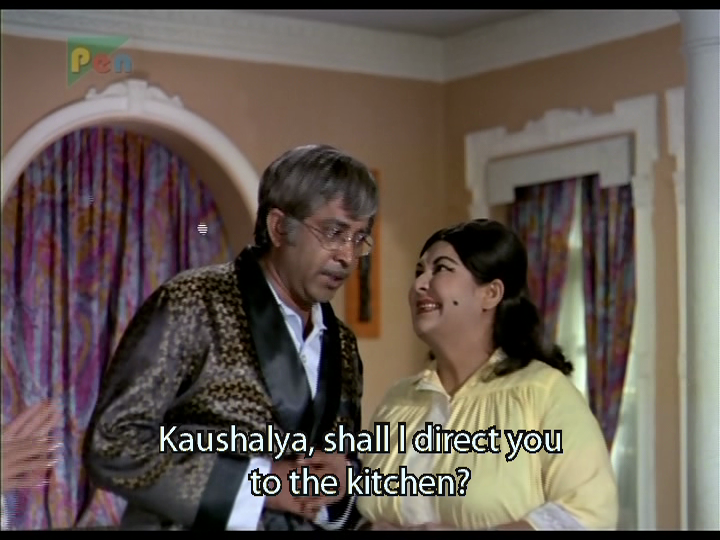 Anyway, the focus at this point is much more on Kaushalya who is the best wicked aunt ever. 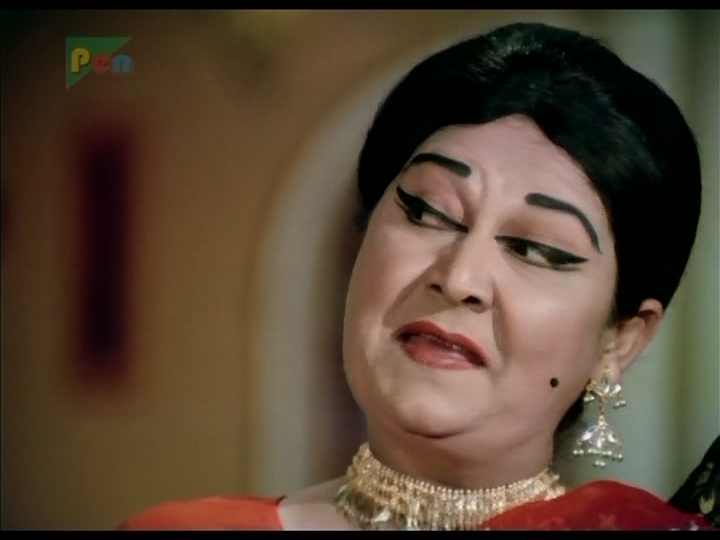 Manorama is outstanding in her role as Kaushalya and has the best selection of grimaces I have seen outside of a gurning competition. Here is just a selection of some of her expressions which she uses to excellent effect. 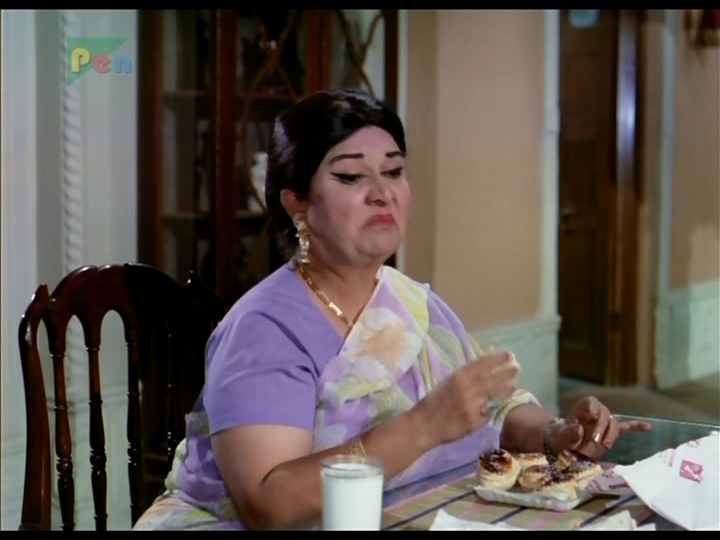 Honey Irani appears in front of the camera in one of her first roles as an actress playing the mean and spoilt mommy’s girl Sheila. I love the way she stands and screams as an iron burns her sari rather than just lifting out a hand to move it away. She really does seem to believe she is the delicate flower her mother calls her and she wonderfully nasty towards her cousin. Ranjeet is appropriately sleazy and obviously the villain once he turns up in a selection of increasingly bad shirts and terrible scarves. After Seeta’s trials and troubles have been established we are introduced to Geeta. What a difference! 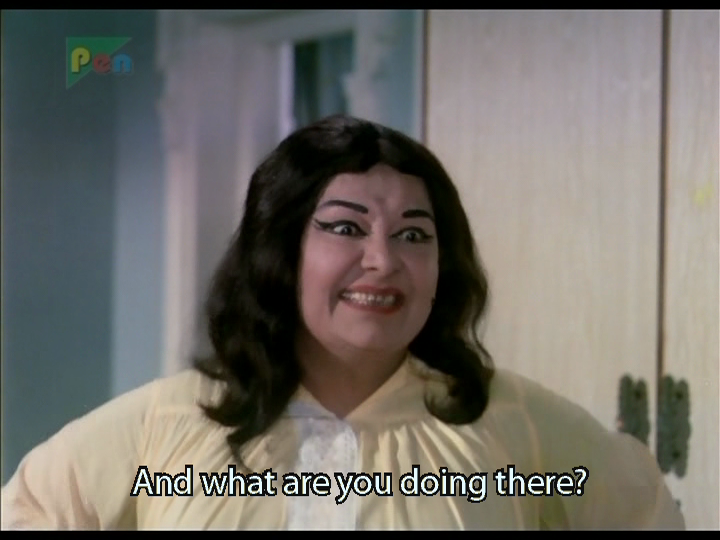 Seeta is introduced in a scene where she is scrubbing the floor and her evil aunt is yelling at her. Geeta is introduced by a song – upbeat, full of life and fun, it’s an apt description of Geeta and her outlook despite her humble status. 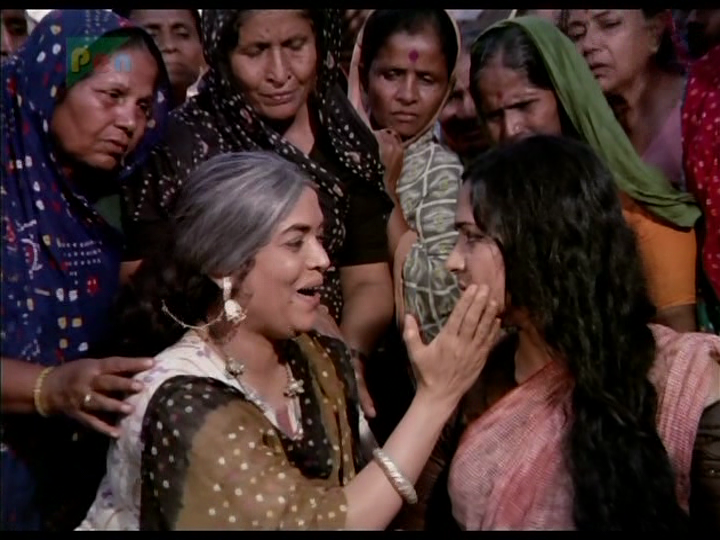 Geeta lives with her mother and works as a street performer with Raka (Dharmendra) and Jhumroo (Master Ravi). She’s loud, vivacious, a bit of a crook and nothing at all like her twin sister. There is much made of the differences between the two: Geeta’s fiery nature and her loving relationship with her mother for example, compared to Seeta’s meek obedience and her constant craving for her lost parents. It all sets the scene for the inevitable switch between the two sisters. After further abuse and inappropriate attentions from the slimy Ranjeet, Seeta finally escapes from the house and Kaushalya reports her as missing to the police. However Geeta happens to be at the local police station where she is ‘recognised’ as the missing Seeta and picked up by her ‘aunt’ and ‘uncle’. 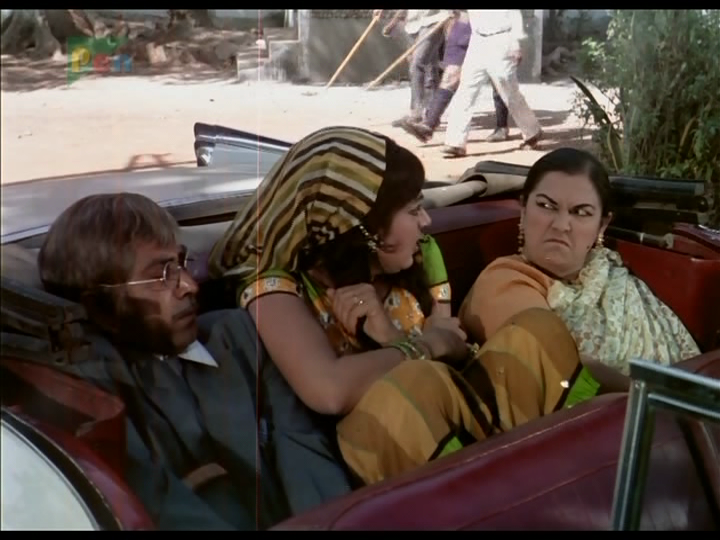 On the way home Geeta decides she doesn’t want anything to do with the crazy fat lady and escapes, ending up hiding in a car with Dr Ravi (Sanjeev Kumar) in a coincidence that is only ever possible in Bollywood. Dr Ravi has already met Seeta as a possible marriage candidate and at the time wasn’t impressed at the way Kaushalya presented her niece, but he finds the new ‘Seeta’ intriguing and the two end up falling in love. Since she feels sorry for the grandmother, Geeta ends up back in the mansion living with Seeta’s family, but she doesn’t appreciate the idea of being their servant and certainly won’t put up with any abuse. It’s a shock for everyone in the family when their previously docile slave lashes out and forces everyone else to work instead. 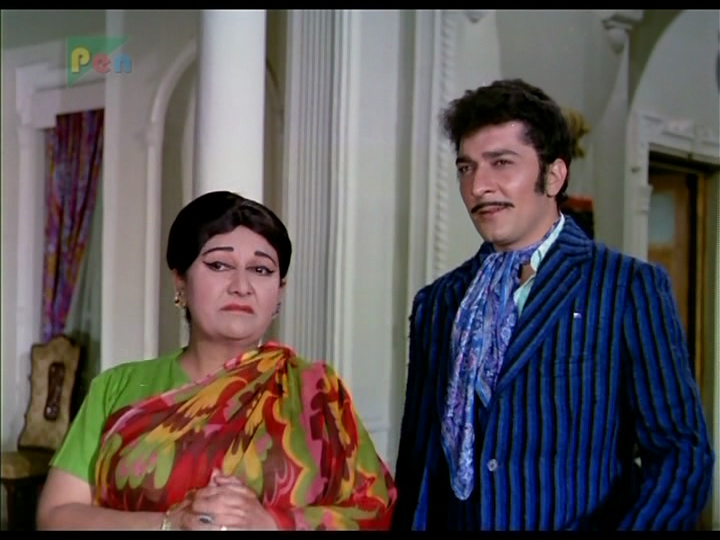 Geeta is hilarious as she pretends to be Seeta and turns the tables on Kaushalya and Ranjeet. There is so much to laugh at, but also plenty of drama and a good balance between the two. It all works so well because of the excellent performance by Hema Malini as the two different sisters. Geeta is a strong and determined character and Hema conveys this resolution with body language and expression just as much as by the dialogue. Seeta is quieter and more submissive, keeping her eyes downcast and her voice softer, but in her own way is just as determined to get what she wants once she breaks free of her restrictive family. It’s hard to believe that no-one seems to question the identity of the two sisters, especially since Hema makes them two very different people but no-one ever seems to consider the possibility and that allows the chaos to continue. While Geeta is busy reforming Seeta’s family, Seeta is found by Raka who naturally thinks she is Geeta and takes her back to Geeta’s foster mother Leela (Radhika Rani). Seeta blossoms with the love of her new ‘mother’ while Leela is amazed to have a daughter who can cook, sew and volunteers to visit the temple. Despite her abysmal attempts at street performing, Raka falls in love with Seeta while for no real apparent reason, Seeta falls in love with him. Although to be fair he is probably the first person she has met who is as self-absorbed about his orphan status as she is, and their shared misery does create a bond. Their wedding is set, as is Geeta’s to Dr Ravi but of course the path of true love never runs that smoothly and there is still the confusion between the two sisters to sort out. Although Raka tries to save the day, in the end it’s Geeta with a little help from her sister who proves that anything a Bollywood hero can do, a heroine can do even better. It’s all totally crazy, over the top and Hema seems to have an excellent time beating up all the bad guys in the fight scenes. The cast here are all excellent and they are perfectly cast to fit well into their roles. Sanjeev Kumar is effortlessly charming and debonair as Dr Ravi. His assertion that he wants a good Hindustani girl as his ideal wife did make me groan, but despite his initial statement he doesn’t seem to mind when Geeta dresses in more Western style clothes and he positively encourages her to go roller-skating (which may actually be something that good Hindustani girls do considering the number of times it happens in films). 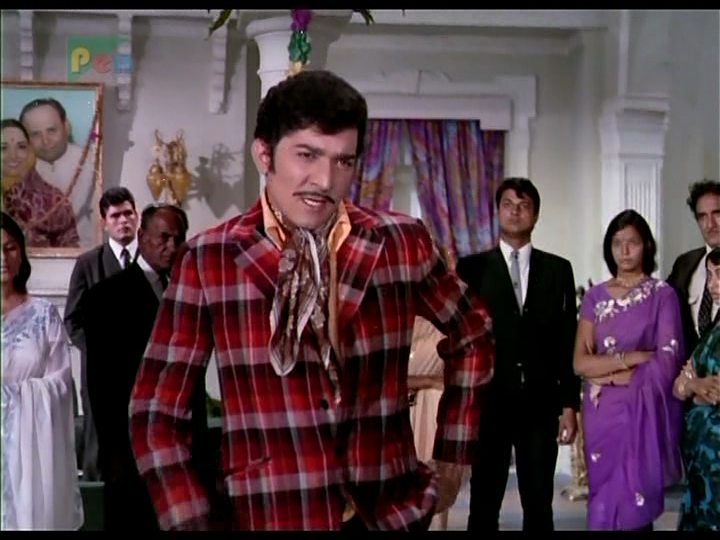 I’m often quite ambivalent when it comes to Dharmendra, but since he is rather overshadowed by Hema Malini and his over acting goes almost totally unnoticed beside the caricature of Kaushalya, I really enjoyed his performance. Both Pratima Devi as the long-suffering grandmother and Satyendra Kapoor as Kaushalya’s hen-pecked husband provide excellent support, as do the various other members of the cast. 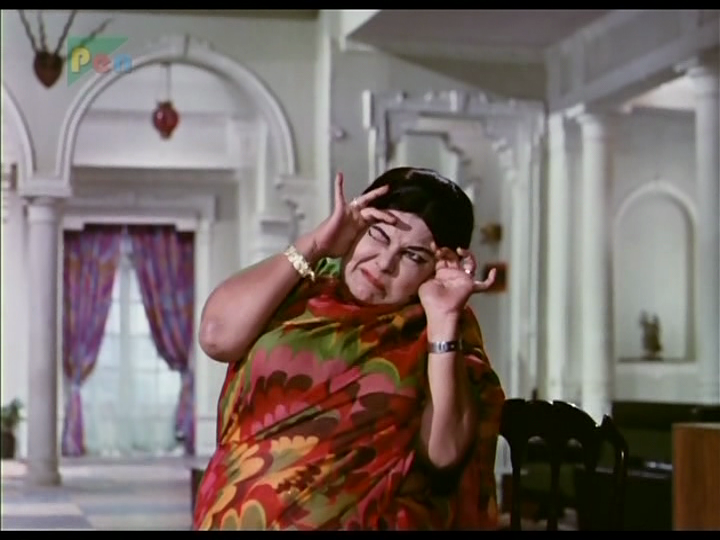 But it’s Hema and Manorama who are the two essential elements to the film and their scenes together still make me laugh every time. 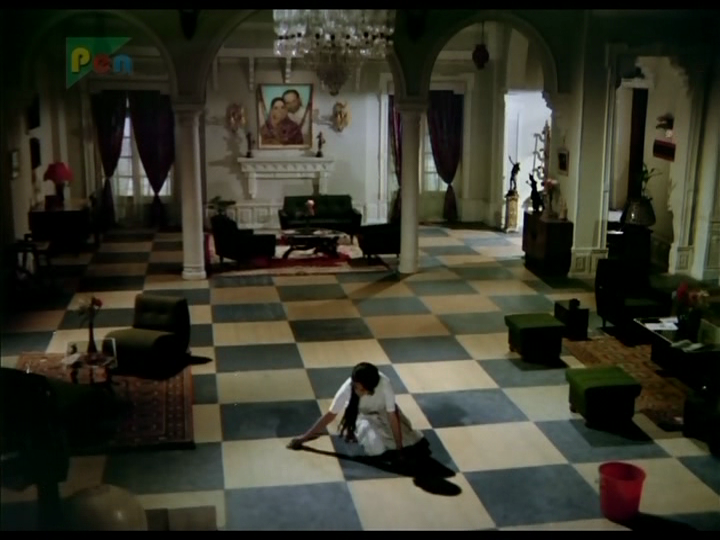 The music is by R. D. Burman and his songs are lovely and well-integrated into the story. Asha Bhosle and Lata Mangeshkar provide beautiful vocals for Hema while Kishore Kumar and Manna Dey provide the male voices for Sanjeev Kumar and Dharmendra. The songs are all pictured on Geeta rather than Seeta which is perhaps a shame, although there is one solo song with Dharmendra which works well. I love this famous song with Geeta pretending to be drunk to dissuade Dr Ravi from marrying her. 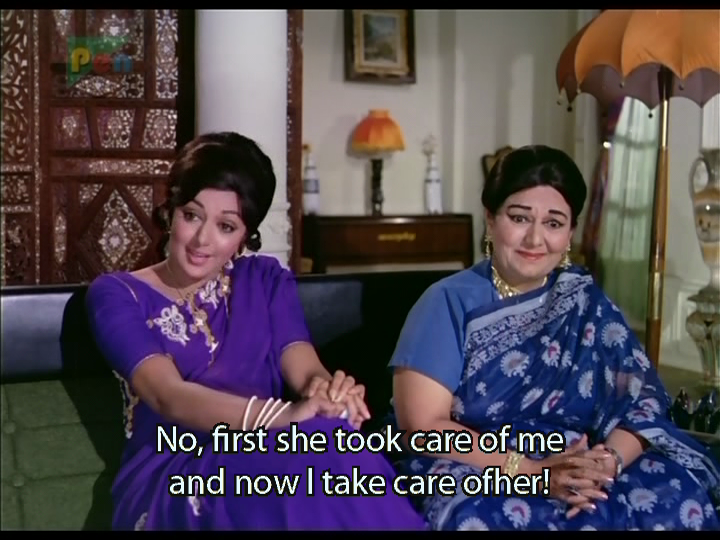 It’s funny but very sad too and while Hema is excellent, Sanjeev Kumar provides excellent backing for her drama. Javed Akhtar, Satish Bhatnagar and Salim Khan have done a great job adapting the ‘Prince and the Pauper’ storyline to suit a Bollywood audience and the dialogue is well written and very funny. Director Ramesh Sippy keeps everything moving along and despite knowing the switch is going to happen he still builds plenty of suspense into the story. This is a total Bollywood classic for me – great performances, good songs and excellent comedy, all delivered with such style by Hema Malini. I absolutely love this film and I’ve lost count of the number of times I’ve watched it. A full 5 stars! 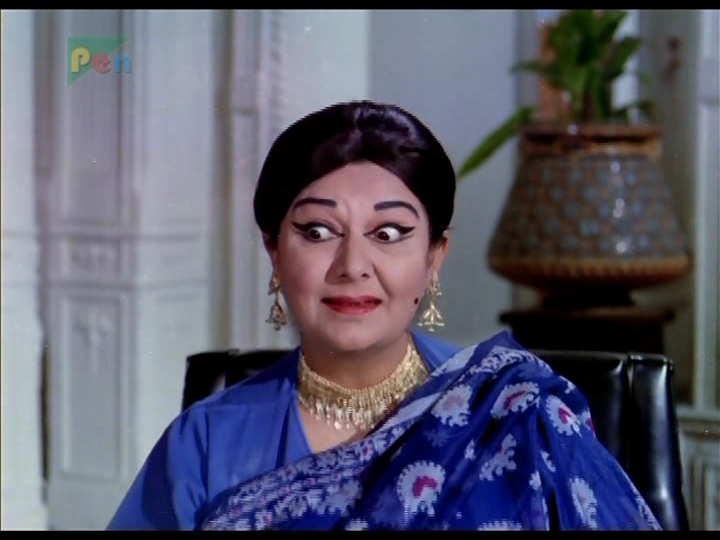 I like Seeta aur Geeta, but I don’t love it. I first saw it several years ago and I really liked it at the time. I’ve watched it a couple of times since, and each time I enjoyed it a little less and fast forwarded a little more. 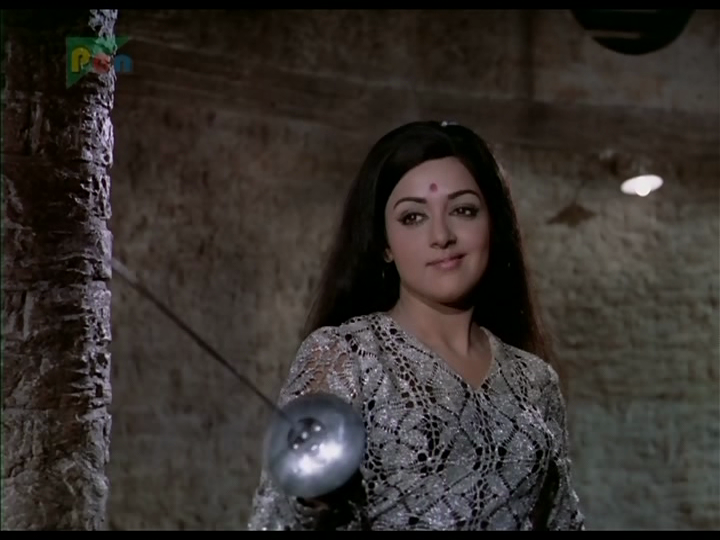 I can’t quite warm to Hema Malini, Sanjeev Kumar is not my idea of hero material and I lack the Dharmendra Swoon gene. So it all comes down to the story and the characters. I really like the way the story plays with the masala tradition of twins separated at birth, and there are lots of fun moments as Geeta impersonates Seeta. But it does drag on a bit once the twin swapping starts, and Seeta is such a wet dishrag that I get restless whenever she is at centre stage. Geeta is more lively but as with so many filmi heroines, she can only get a husband when she pretends to be something else – in this case, a demure young lass like her sister. So that detracts from the ‘you go girl’ mood as it turns into ‘you go girl and put on a nice sari and a long-sleeved high-necked blouse’. I also found the roller skate scene stupid and not in a good way – Geeta was a tightrope walker and acrobat and all of a sudden she can’t work out how to balance or control her body? Yes she was on wheels, but it was just a lazy way of asserting the hero’s superiority when there was no real need. Kickarse girls can only kick so much before decorum demands they are put in their place. 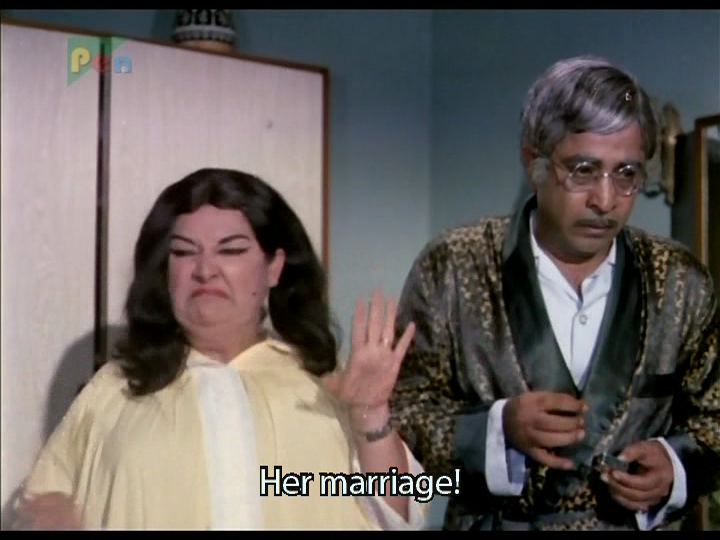 And then to have Sanjeev Kumar as the vision of young love…oh dear. The romances didn’t grab me in the slightest as neither couple seemed to be well suited or even mildly interesting. There wasn’t really enough of a threat or menace to keep the dramatic tension either, as most of the ‘bad’ characters were more slapstick than villainous. Overall, I like this enough to say see it as a good timepass. It’s colourful, the music is pleasant although I don’t think it’s great, the mood is generally upbeat (apart from all the attempted rapes and beatings). 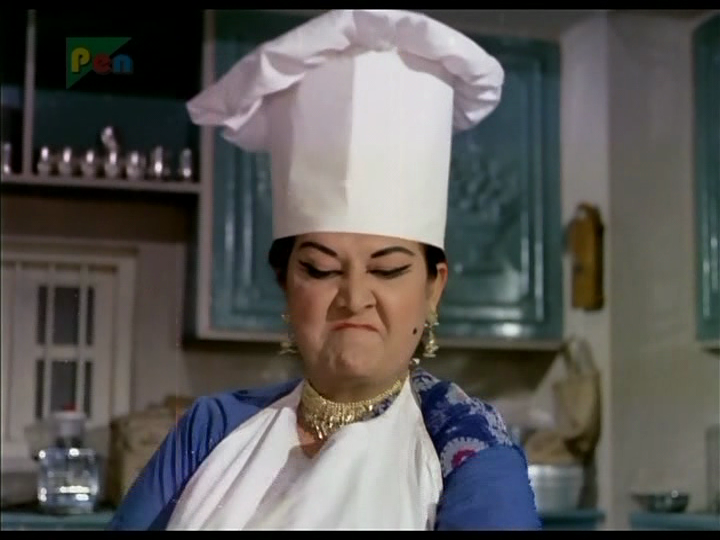 But it’s not a film that rewards repeated views and there are many other masala favourites I would rather see again. 3 stars. This entry was posted in Bollywood and tagged Asha Bhosle, Dharmendra, Hema Malini, Honey Irani, Javed Akhtar, Kamal Kapoor, Kishore Kumar, Lata Mangeshkar, Manna Dey, Manorama, Pratima Devi, R. D. Burman, Radhika Rani, Ramesh Sippy, Ratnamala, Roopesh Kumar, Salim Khan, Sanjeev Kumar, Satish Bhatnagar, Satyendra Kapoor, Seeta aur Geeta. Bookmark the permalink. This one is a nice change from the usual male twin stories in Bollywood….I agree with some views of both the reviewers on the movie….a movie, according to me, which is just “timepass” at some times and ‘really great” at other times…repeated viewings do have their effect after all! Dharmendra, surprisingly, could not create the magic of his on-screen chemistry with Hema Malini in this movie…but Sanjeev Kumar did make a good pair with her…overall….for the acting, comedy, music, drama and all….3.5 stars from me! I would like a review of the following movies at CinemaChaat…. Eagerly waiting for reading your valuable views on the movies mentioned above…. I think this was the first Bollywood film I saw which had a more active role for the heroine, and certainly the first where the heroine gets to take part in the fight scenes. 🙂 That may be why it made such an impression on me, and why I enjoy it as much as I do. Hema Malini looks absolutely stunning in this and I do like Sanjeev Kumar as her romantic hero. I don’t think there is much opportunity for her to have such a good rapport with Dharmendra though as Seeta doesn’t have quite as much screen time as Geeta and has a more reserved character overall. The romance between Seeta and Raka isn’t as convincing on a number of levels but Dharmendra is good as Geeta’s friend and that’s a more convincing relationship as well. I only got around to seeing this a month or so ago, and I loved it for its heroine-centric focus. It was a very different film, especially for its era. Although I can see the validity in some of Temple’s comments, especially regarding the roller-skating scene, I’m prepared to cut the movie quite a bit of slack because of how it compares to other films of its era. It WAS a progressive film, with an approach that was ahead of its time. If it hadn’t entirely ditched the patriarchal baggage, I don’t think that detracts from the fact that it made much more of an effort than almost any other film of the time. Especially given the fact that it was a masala entertainer. A movie like Teesri Kasam was very heroine-centric in another way, and was less in step with the male-oriented norms of the time, but it tanked at the box office. 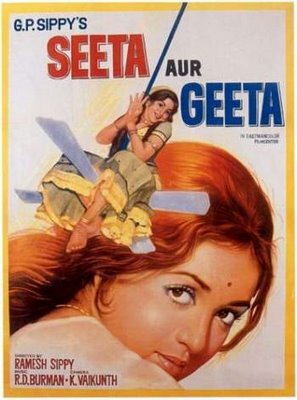 I’m sure an argument could be made for saying that Seeta aur Geeta did a better job of showing the possibilities open to women precisely because it was a big starrer commercial film, even if that entailed some compromises. Either way, it was a perfect candidate for Adam’s Rib, and Heather & Temple both did a bang up job reviewing it. Thanks! I also found the comedy very funny and I liked that it was mainly centred on the heroine(s) as well. 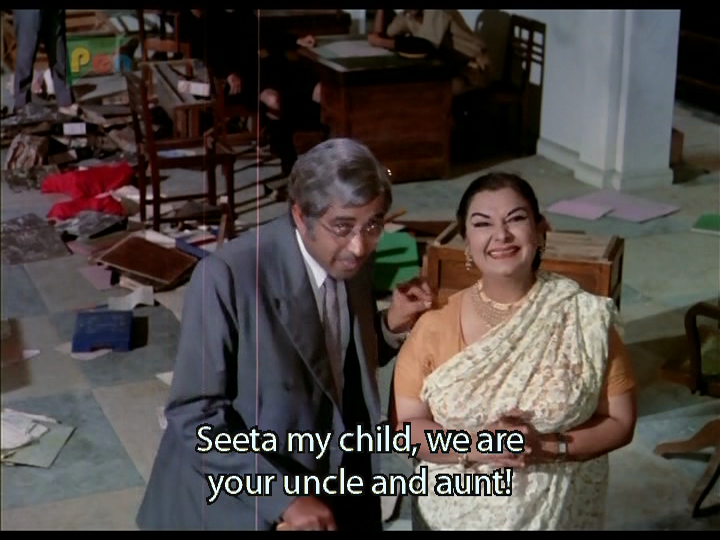 No annoying comedy uncles or servants (the bane of my movie-viewing experience) but instead a very amusing comedy aunt! For me this film will always remain special because I went to see it with my mum as a 13-year old and I remember her giggles and snorts of laughter – oh how I miss that! She had such an infectious laugh! A film which brings back lovely memories..
Hehehehe So no going google-eyed with Dharam, hey? How sad for you hehehehe I abs. agree with Esha 🙂 Poor girl!! I like ‘Seeta aur Geeta’ in comparison to the other twin sister movie by Sridevi (Chalbaaz?). 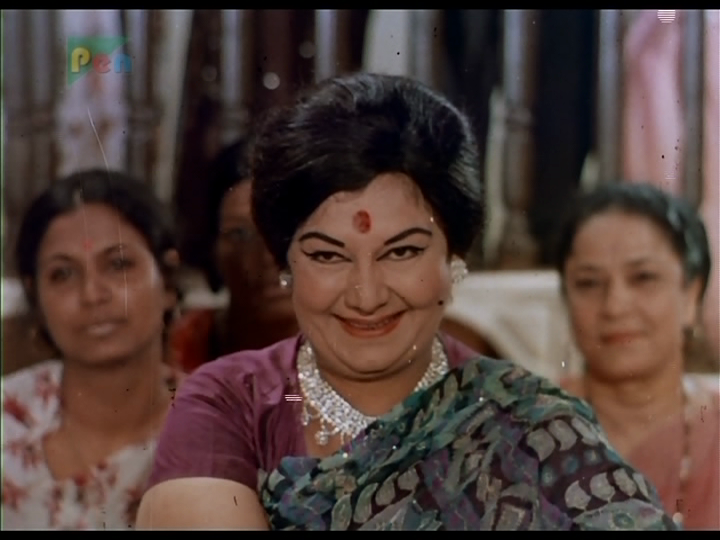 Hema was so much better than Sri in showing the fiery gal part. I second the request for the reviews of all three movies suggested by Pulkita above. Although, I suppose one has to be a teenager to truly appreciate ‘Geetanjali’. I’ve never seen Chaalbaaz (even though I do love Sridevi) as I’m really not a fan of Sunny Deol. I do have a copy though, so really should watch it at some stage. I just need to psych myself up for Sunny – which may take some time! Thanks for endorsing Pulkita’s recommendations as well 🙂 It can be very difficult to find the older films, and it’s often impossible to find copies with subtitles, but I am trying to track down copies of these and a number of other films that have been suggested.